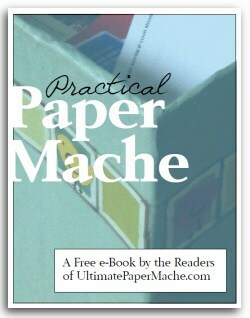 Click here to download the Practical Paper Mache e-Book and save it to your computer. All of the ideas in this free e-book were submitted by our readers, who have graciously given permission to include their photos and descriptions of their own unique (and useful) paper mache creations. A big thanks to everyone who submitted their ideas for this project – this was really fun. I’ve never worked on such a large collaborative project before, but now I have the bug. What shall we do next? If you would like to comment on any of the projects in the e-Book and let the artists know how much you like their work, you can find each individual item shown in it’s own online page by following the links below. I know they would all love to hear from you. Paper Mache Doll Furniture – A unique set of patio furniture for dolls. Paper Mache Egg Cup – A whimsical egg cup, made from paper mache and then covered with three coats of varnish. Paper Mache Fantasy Animal – This unique critter is also a vase for flowers. Paper Mache Photo Prop Egg – A perfect setting for those Easter photos. Paper Mache Angel Chair – People love sitting in the chair and having photo’s taken! Bird Bowl (Kevin from the movie Up) – Have you ever seen such a happy fellow? And he’s practical, too. Paper Mache Food Saver Shelf – A custom-made shelf that works perfectly and cost about 37Â¢. Paper Mache Hot Glue Gun Holster – Just the thing for keeping the heat and glue off the table while you’re working. TY very much!!! You are a myth for me! Thanks to your lessons I’m starting to build with paper mache and I think I’m at a good point with my Humpty Dumpty 😉 …. I’ll show you pictures as soon finished…. I have to say thank you Jonni for the download of the Practical Paper Mache book. I have this urge to CREATE something, anything and your art work, inspirational videos and web site have given me just the start I needed to begin a project. I am a huuuge Wizard of Oz fan and have been since I found the book in my Grandma’s cupboard as a child. The woman that played the witch, Margaret Hamilton, lived in Painesville, Ohio for a time….imagine…..my very own hometown! I would love to make a mask complete with a witch’s hat to hang on my wall and shadow frame with a few items and pictures I have collected over the years. I know I can do it now with your wonderful instructive methods. I am just a beginner and am thrilled to have some projects to work on. Thanks so much. I have read your posting of the “free” book and enjoyed it. I am still wondering why anyone continues to use wheat or flour paste with the inherent problems of that “glue” medium. The Elmer’s powdered paste (celulose glue) is so far superior and the cost is negligible at about $2.50 per 2 oz box of powder that makes (at least) a gallon on paste when mixed with water. Gone are all problems of mold and/or drying issues. It dries overnight usually. Since using it on class projects for years now, I find that students are not “grossed out” like they are by wheat paste. As I mentioned work dried quickly usually over night. Wheat allergies cease to be an issue. Do try it! Here is my latest paper mache project. A girl sculpture over a plastic bottle armature. Hi Carol. Your image didn’t come through – probably because the file size was too big. Please give it another try. I’ll check into that powdered paste. I just found it on amazon.com. I’ve heard really good things about methyl cellulose, but whenever I looked into it, it seemed to be really expensive. This stuff is cheap. Thanks for mentioning it! Carole, I value being able to use a more natural product and so I still choose to use the basic flour recipe. I prefer not to use glues for a more eco-friendly choice. It looks like paper mache can me a lot stronger than I gave it credit for. If it can be used to build a wall organizer or even a shoerack, then certainly it should (with a little non-newspaper assistance) be able to hold my Playstation 3? I estimate it to be about two, maybe three kilo’s tops. So, what’s your expert opinion? Is it worth attempting, or is one game of Tokyo Jungle going to make for a very expensive barbeque? Hey iâ€™m sorry for posting something that doesnâ€™t really have anything to do with this post but Iâ€™m wondering if you knew any magazines/newspapers (online/hard copy) that talk about paper mache? If you do please give me the link (if online) or the title of article and date published author etc (if hard copy/printed). Any help would be much appreciated thank you! I am trying to figure out how to make a form for a foot… About 8 feet long, 3ft wide and 4 tall for a parade float… Any suggestions for an amature? For something that large you’ll probably need to make a wooden frame and fill out the shape with chicken wire. If it looks possible, he could use the basic instructions for the paper mache panda, but make the arms longer and the yetti standing up. It would be oainted white,I don’t know how he would make it furry, though. This would be a pretty involved project, though. Taping up the crumpled paper would probably require an extra pair of hands. The easier option would be more two-dimensional, like the projects in James C. Cochrane’s book Paper sculpture. For some of his easier projects he has kids cut out a flat figure from cardboard, cover the cardboard with a few layers of paper mache, and then let it dry. When it’s done it can be painted white. If the snowman’s feet are bent forward before the paper mache is added, it should be possible to prop him up or glue him to a wide cardboard base. That’s the technique I’d use, I think. I am trying to make a paper mache globe 7ft. This is for a Christmas parade we are entering this year. I would like it to be strong enough to be mounted, somehow, on a Christmas tree pole placed on a rotating tree stand. My idea is to have the world slowly turning on the float while we are in the parade. Any help or ideas are greatly appreciated!! This is a new one – With something that huge, you’d almost need to make it hollow so it wouldn’t be excessively heavy. And yet it needs to be strong enough so it won’t be damaged if someone bumps into it, and so it can be securely attached to the stand. This is beyond my engineering experience – if you can possibly snag a copy of Monique Robert’s book, you could use her hollow-crafted sculpture ideas to make your globe. I’ve never seen anything else even close to what you would need for this project. Good luck with it. And please let us know how it turns out. Thank you for the paper mache elephant tutorial, we had a fantastic time making ours!! it stood at 5ftish and was used for our local summer carnival for ‘Anna and the King’. So my grandpa’s birthday is coming up and i was trying to think of a creative way to wrap his gift. i came up with a paper mache ball. i blew up a balloon and covered it with paper mache. after a few layers, i popped the balloon and pulled it out of the paper mache shell. i then cut a hole in the paper mache shell and put his present inside. then i covered the hole with paper mache and let it dry. after that it just looked like a paper mache tear drop. i wrapped it up and gave it to my grandpa. it was amusing, watching him try to figure out what it was that i gave him. I inted to do this same thing with my 5 year old sister’s present in a few months. it is very fun and great for all ages! I am aboud to stard a weird and large paper mache project, and i would love to hear comments and/or suggestions from you awesome bloggers. I am about to make a Hand Chair. a photo of one i like can be found at http://www.displaystatues.com/index.php?main_page=advanced_search_result&search_in_description=1&keyword=fiberglass+hand+chair by searching “fiberglass hand chair ”. i saw a hand chair when i was a child in a health food store and have been amazed by them ever since. the only problem is, how do i get started? i know i’ll have to build a base, but i’m not sure how, and out of what? i would love your help! Hmm – it has to be really strong, and it has to be balanced so that you don’t fall over backwards. Rebar inside the armature, maybe? I use PrintShop Pro from Broderbund and a PDF converter program that I bought online. The PDF converter program did not cost a lot and it helped me convert a lot of my ebooks to PDF Files. Broderbund’s Print Shop Pro also comes with a PDF converter program built in. Those programs do not cost an arm and a leg and are easy to use and gives a newbie a chance to get experience. I’m going to look into this too! It’s looking brighter and brighter for this venture that I can’t wait to get started on. I haven’t heard of that program, but I do like the price. I use Serif PagePlus X4 and I really like it. I think they have a free version, too, but I can’t swear to it. It’s very easy to use and creates a PDF with the settings that are required by printers, or you can choose settings that make smaller files for web viewing. I think the company is in England, and they have very good customer support. Oh, and now I want to write an e-book! By any chance would you mind passing on some tips, tricks, or where an illiterate computer person could go to learn this? I looked into it last year and got so C O N F U S E D, I finally stopped thinking I could ever do this. Hi Sharon. There are now two different (and relatively easy) ways to make an e-book that I know of. One is to just write your book and save it as a PDF. If you have a lot of illustrations, you can use a desktop publishing program instead of Word, just like I did for my paper mache book Make Animal Sculptures With Paper Mache Clay. You can see the programs I used in this video series. Once you have your PDF you can either send it to a printer or just upload the file to your website’s server so people can freely download it, like I did with our Practical Paper Mache e-book (To download the e-book and save it to your computer, right-click on that link). This seems to be the way to go for a book with illustrations or photos. Adobe has a free online service that will convert a Word file to a PDF, if you don’t have a program on your computer that can do that for you. If you want to sell the PDF e-book instead of giving it away, you can use the system provided at ClickBank. Anyway, it looks like the easiest way to write your e-book for Kindle is to just write it in Word, with very limited formatting. I’ve heard that illustrations, tables and even bullet points get moved around in weird ways by their software. Then you upload it to their server and their program does something or other to it so it can be used in their reader software. Did I make it even more complicated? I hope not. The thing to know is that it really isn’t complicated at all, in spite of this clumsy explanation. Contact me if you want a more detailed explanation – I’d be happy to help if I can. Well, it does look a bit intimidating but if there is a way for me to figure this out, I’m certainly going to give it my best shot. Love that you use the word “easy”…that gives me hope.